Ever been inspired by your dreams when the devil visited? Tartini was. This image would make a fantastic tattoo. 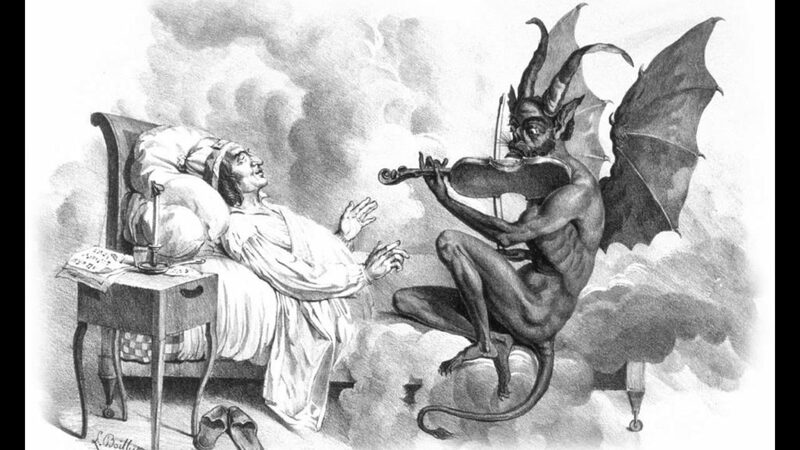 Tartini’s intense frustration with not being able to re-create something he heard so clearly in his dream is something all performers, and composers can identify with. I’ve had those feelings, whether it was a piano piece not coming together the way I imagined it, or less urgent matters such as a recipe I was fiddling with, that didn’t turn out the way it should taste, or an outfit I put together in my mind’s eye that looked ridiculous upon wearing it. Anne-Sophie Mutter coolly performs the “Devil’s Trill” with pianist Lambert Orkis. The piece builds and gets more and more exciting and intense as it goes. Giuseppe Tartini was born April 8, 1692 in the Republic of Venice (now Slovenia) and died February 26, 1770 in Padua, Italy.